The development of the SiroSet process by Arthur Farnworth and colleagues at the CSIRO Division of Textile Industry in Geelong in 1957 allowed woollen fabrics to remain internationally competitive with synthetic fabrics in the market. The development of SiroSet has been hailed as a major CSIRO discovery. The SiroSet process for durable creasing and pleating of wool fabrics was rapidly adopted worldwide and it is still being used some 50 years later. In 1959, Arthur Farnworth extended his work on the SiroSet process to develop the first non-iron process for wool fabrics, known as Sironizing. This was in response to the situation at that time, where research on resin-finishing of cotton had led to very successful wash-and-wear products. There was a demand for similar features in pure wool fabrics and Farnworth realised, and then was able to show, that the SiroSet permanent pleating methods when combined with effective shrinkproofing, would produce washable non-iron woollen fabrics. For his role in the development of SiroSet, Arthur Farnworth was created a Member of the Order of the British Empire in 1958. 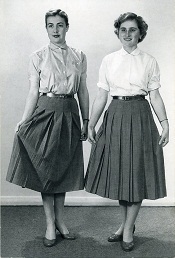 The requirement for a process for permanent pleating of wool fabrics arose in the 1950s when wool was under considerable pressure from synthetics, particularly polyester, that could be heat-set to give permanent creases and pleats. Accepting the challenge Arthur Farnworth and colleagues Joyce Harrison and R Bunsirithum at the CSIRO Division of Textile Industry in Geelong, examined a range of possible setting agents and found that thioglycollates could be used to produce rapid setting. This work led to the development of the SiroSet process for durable creasing and pleating of wool fabrics. Details of the process were published in G-Reports in 1957 and 1960. The extent of the challenge was highlighted in the paper describing the process in 1960 when Arthur Farnworth recalled: ‘ Trouser manufacturers in Australia had expressed an interest in a permanent creasing process, provided it was cheap to apply, did not involve extensive new plant or costly modifications, and did not require longer than 30 seconds’. The process developed by Arthur and his colleagues relied on the spray application of a limited quantity of dilute ammonium thioglycollate at pH 7.0 immediately before steam heating, either by steam pressing for trousers or steaming in a steam box or autoclave for skirts. The possibility of discoloration of the thioglycollate solution by the presence of traces of iron meant that non-ferous spray equipment had to be employed. There was also some alteration in the shade of certain dyes in the SiroSet process and the leading dyestuff manufacturers published tables giving dye fastness figures for their wool dyes towards SiroSet processing. Arthur related the story of how, in the infancy of commercialising SiroSet, a major garment manufacturer was besieged by customer complaints when the ‘permanent pleats’ in retailed menswear had failed. Arthur was summoned to the factory to trouble-shoot this crisis, and established that the staff who were employed to apply the liquid chemical ‘ a smelly thiol ‘ along the pleat before pressing the cloth were offended by its odour, so had chosen to replace the active component with a far more pleasant-smelling ‘ but unfortunately inactive ‘ chemical, without telling anyone! The staff were directed to resume using the thiol, but the work was to be done up on the roof of the factory until a more satisfactory arrangement was made. Thus the reputation of SiroSet was saved. Athur Farnworth and Jack Delmenico published a book entitled Permanent Setting of Wool in 1971 as part of the Merrow Textile Technology Series [Merrow Publishing, Watford, England]. They noted that the use of ammonium thioglycollate in the USA led to an unexpected difficulty with residual odour in SiroSet-treated garments. This arose from the particular method of preparation of the chemical, and was due to traces of impurities in the thioglycollic acid. Monoethylamine sulphite was found to be a suitable alternative to avoid the odour problem, and has been used exclusively for permanent creasing in the USA, Japan and Europe. In 1958 Arthur Farnworth was created a Member of the Order of the British Empire for his work on SiroSet at the Division of Textile Industry. The SiroSet process was rapidly adopted worldwide, with some 10 million units of production treated in the first six years. It is still widely applied throughout the world: the number of treated garments in Japan alone exceeded 4 million in the year 2000. The invention is also recognised through a street named Siroset Close in Dunlop, ACT, and its definition appears in the Collins, Macquarie and on-line dictionaries. In 2006 the SiroSet process was recognised (No. 6 of 14) in a series of Australia Post maxi cards celebrating Australia’s science, Australia’s future ‘ CSIRO’s 80th anniversary. In their 1957 paper describing this work Farnworth and colleagues proposed that the setting process involved the breakdown and reformation of hydrogen bonds following scission of some cystine disulphide cross-linkages. In 1964-65, Syd Leach (who later became Professor of Biochemistry at the University of Melbourne), Brian Milligan, Bruce Caldwell and colleagues presented evidence to show that the mechanism involved disulphide bond re-arrangement by thiol/disulphide interchange. Wool proteins are rich in the sulphur-containing amino acid cystine which is involved in numerous disulphide bonds between both the matrix proteins and the microfibrillar proteins in the wool fibre. The new arrangements of disulphide bonds generated during the SiroSet process helps to stabilise the new structure if reversion is inhibited by preventing further interchange. They found no evidence for the formation of cross-links other than disulphide bonds. The Leach, Milligan, Caldwell hypothesis accounted for the fact that the rate of setting in boiling water was enhanced by the addition of reducing agents such as bisulphite or thioglycollate, which generate extra thiol groups. It also explained why wool in which the natural thiol groups have been destroyed could not be set in water unless reducing agents were added. The occurrence of thiol/disulphide interchange was also demonstrated during the release of set. Release was accelerated by thiol-producing reagents and retarded by conditions which inhibited interchange. A higher level of set could therefore be obtained by blocking or oxidising free thiol groups in the set fibres, particularly after short setting times. Cross-linking reagents were no more effective than monofunctional blocking agents for this purpose. Arthur Farnworth quickly extended his work on the production of durable creases for trousers and pleats for skirts to develop the first non-iron process for wool fabrics, known as Sironizing. At the time, research on resin-finishing of cotton had led to very successful wash-and-wear finishes for cotton products, and there was a demand for similar features in pure wool fabrics. The major requirements for a non-iron garment are dimensional stability and retention of appearance after laundering. It was realised that the SiroSet permanent pleating methods when combined with effective shrinkproofing, would be of value in producing washable non-iron woollen fabrics. The Sironising process was released to industry by Arthur Farnworth, Menzie Lipson and John McPhee as a G-report in 1959 and fully described in two papers published in 1960. The fabric was shrinkproofed and dyed before Sironising. Dilute sodium bisulphite was applied by a padding process and the fabric was then steamed damp on a blowing machine. Final drying was carried out with overfeed to eliminate warp extension. Adequate precautions were needed to allow for weft shrinkage on drying, so as to produce a fabric free from relaxation shrinkage. The experimental work and the transfer of the process to Australian mills were done with assistance from Val Tomljanovic, Lexie Boardman, Doug Feldtman and Barry Harding from the Geelong Division and John Alexander of Leeds Dyeing and Chemical Works Pty Ltd, UK. Williams VA, 1998, From Fleece To Fabric, 1948-1998 ‘ 50 Years Of Wool Textile Research, CSIRO Publishing, Melbourne, pp.132-133. Farnworth M, Farnworth P, Farnworth L, 2010, Personal communication.